All these cars, we believe, will handle and look at their best on the 180HR15 Michelin XAS, which we now have on special offer. In 1945 a successful engineer and race driver from Warwick named Donald Mitchell Healey designed and built a 2-seater sports car with a 2.6, 4-cylinder engine called the Healey 100. The car debuted at the 1952 Earls Court Motor show to a great deal of interest not only from the media, but from the general public, with great demand to produce the car. The car went into production later that year with financial backing from the Lord of Austin. The Austin Healey 100 was born. The next generation car was produced in October 0f 1956, the Austin Healey 100/6. The new car had undergone more development than its older brother and was fitted with a 6 cylinder engine, hence the name 100/6. 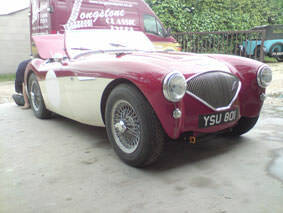 This all came about due to the Austin Healey 100 being so successful on the motor sport scene. As is still true today, back then success on the track reciprocated with success in the showroom. 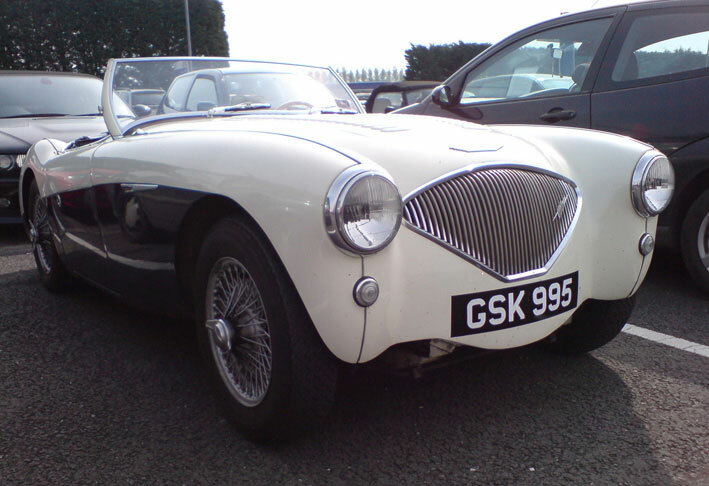 More success and more development led to the third car to leave the Austin Healey stable. The Austin Healey 3000. Still widely regarded as one of the greatest British motorcars ever produced. If you require new Borrani wire wheels for your Austin Healey then please click here for information on Borrani wire wheels. 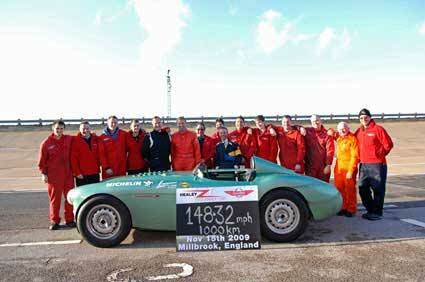 The recreation of a special test car has been a dream come true for owner Martyn Corfield. He has wanted to own one of the original works special cars for years. "I have always longed for one of these cars and to be able to restore it to full competition status. After many years searching I came across a letter from the Austin works to Donald Healey stating that the original streamliner 200mph car and its sister 24 Hour endurance car were scrapped in the late fifties after the Bonneville salt had made them unsafe to use. That scuppered my plans for a long time and although I did manage to acquire one of the original endurance car Dunlop callipers and one of the original 2.69 crown wheel and pinions together with an original undertray and black faced speedo (which was adopted to minimise glare in the desert sun) this proved to be as far as I could go in terms of original items". "Then one day I heard a rumour of 'the last known factory lightweight chassis' which I purchased after verifying its likely originality with two known Healey specialists. This chassis is lightened in the ways that the works used and was being used in the seventies to underpin another project. This seemed the best place to start a recreation. I knew that if I was to attempt an endurance record I would have to re engineer the car to a safe and competent standard and as such any old parts just would not do the job even if they existed". "It was my objective to set about reconstructing a car capable of not only replicating the 1954 achievements, but also a car that embraced the spirit and style of the original vehicle (no modern tricks). So I sought professional help from the best Healey competition experts that I could find and put the project in the hands of Jeremy Welch" Says Martyn Corfield. Martyn made contact with us at Longstone Classic Tyres as he required a classic tyre that would be able to cope with constant high speeds and loads, luckily Martyn was going down the same route as Healey originally did and utilised 16" wheels instead of the Austin Healys 15" factory fit wheels. This would give the car a higher theoretical top speed due to the tyres having a larger overall diameter. We decided that the best tyre to use would be the Michelin 600WR16 Pilote X. A "w" speed rated (168mph) radially constructed tyre with the looks and shape of a '50's cross ply racing Englebert tyre. Michelin, to their credit, were more than happy to test a tyre to destruction to find its true limits which were far beyond that which the Endurance Healey was aiming for! The technical department at Clermont Ferrand were also able to simulate the loads that the car would generate at the Millbrook testing ground so were able to offer accurate tyre pressure recommendations.